Frisco, TX – January 11, 2018 – HRchitect, the leader in Human Capital Management (HCM) technology consulting services, has been named a 2017 National Winner for the Best and Brightest Companies to Work for in the Nation by the National Association for Business Resources. This honor comes shortly after HRchitect achieved merit as one of DFW’s Best and Brightest Companies to Work For, for the second consecutive year. The National Best and Brightest competition, now in its seventh year, identifies and recognizes organizations that are committed to excellence in Human Resources practices. Organization’s employees anonymously provide information about their experience at the company including benefits, culture, opportunity for growth, and recognition. Employee response data is then analyzed by an independent research firm and then participating companies are ranked based on overall numerical scores in comparison to firms of a similar size. “Being named a national winner this year, and a Dallas / Fort Worth area winner for the second consecutive year is really exciting to our team. We continue to work hard to find new ways to raise the bar for employee experience, as we know our people are our most valuable resource. Earning an even higher level of recognition than we earned in 2016 is reinforcement that our HR initiatives, culture, family atmosphere, and employee programs continue to make a positive difference” said Matt Lafata, President & CEO. HRchitect would also like to congratulate several of our clients including Aldi, APi Group, Prudential, and Total Quality Logistics, that were also distinguished as 2017 National Winners for the Best and Brightest Companies to Work For. 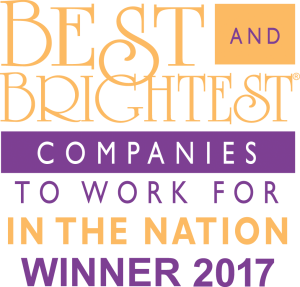 The Best and Brightest Companies to Work For® competition identifies and honors companies that deliver exceptional human resource practices and an impressive commitment to their employees. Organizations are assessed based on categories such as communication, work-life balance, employee education, diversity, recognition, retention and more. Participating companies have the opportunity to benchmark results with other cities such as Atlanta, Los Angeles, New York, Nashville, Chicago and more. Submit your organization and be honored as the best in front of industry leaders, influencers and peers in the December 15th issue of Corp! Magazine’s online publication. All participating companies receive a complimentary assessment report and additional benefits throughout the year. Winning companies are invited to celebrate in one of our many event regions. As the leader in HCM Systems strategic consulting, HRchitect offers end-to-end HR technology consulting services focused around strategic planning, evaluation and selection, change management, implementation, project management and ongoing support of HCM systems of all types including Talent Acquisition, Talent Management, Learning Management, Workforce Management, Benefits, HR/Payroll, and more. Over the past two decades, working on thousands of successful engagements for clients of all sizes and industries across the globe, our experience is vast and unsurpassed. We have expertise around all major HCM systems including Benefitfocus, Ceridian, IBM Kenexa, Oracle, Taleo, SAP, SuccessFactors, Saba, ServiceNow, Ultimate Software, WorkForce Software and more. HRchitect is a name you can trust for all of your organization’s HCM technology-related consulting needs. Learn more about HRchitect on Twitter at @HRchitectNews.